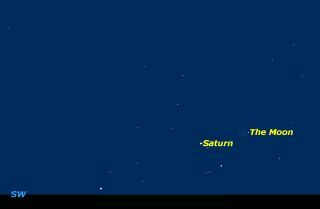 Half an hour after sunset Thursday night, November 12, look for Saturn and the thin crescent moon low on the southwestern horizon. If you've been looking for Saturn lately, you've seen it rapidly sinking towards the sun in the southwestern sky just after sunset. In reality what is happening is that Saturn is moving around its large orbit to a place on the far side of the sun. It will reach that place on Nov. 30, which is called conjunction with the sun. To see them you will need a distant flat horizon and a cloudless clear sky. You probably will need binoculars to pick them out of the twilight glow. While looking at the moon in binoculars, look carefully within the moon's crescent for the rest of the moon, faintly lit by sunlight reflected off the Earth. If you miss out on Thursday, try again the next night. The moon will be much higher in the sky, but Saturn will be even lower. For the rest of November and most of December, Saturn will be lost from view. In late December it will reappear in the dawn sky, joining the "parade of the planets" that includes Venus, Mars and Jupiter. Editor's note: If you capture an amazing telescope view of Saturn in the night sky and would like to share it with Space.com and its news partners for a possible story or image gallery, send images and photos in to: spacephotos@space.com.